Los Angeles, Calif. – January 21, 2016 – The Virtual Reality gaming studio Survios will debut Raw Data, a 2-player cooperative Active VR first-person shooter game, at the VRLA Winter Expo in Los Angeles on Saturday, January 23. 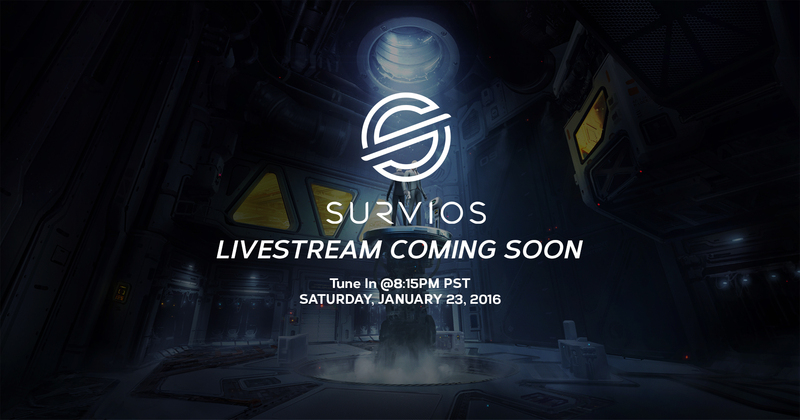 Following the Expo, Survios will host the world’s first livestreamed VR gaming event. Gamers and VR enthusiasts around the world will get a glimpse into the future of broadcast VR gaming via a curated livestream at twitch.tv/survios. Tune in at 8:15pm PST to see the action live! In Raw Data, two players use an arsenal of interactive weapons and deployable defenses to fight off killer androids attacking from all angles. Players move freely around their own separate, physical play spaces in a highly immersive experience that will at the same time feel familiar and groundbreaking to gamers accustomed to FPS games high on action. Raw Data is currently still in production; the VRLA version is a playable pre-alpha demo. The livestream of the post-expo event – a first for any VR game – will be a stream curated by Survios, showing both attendees and viewers on Twitch exactly what is happening both in-game and outside the HMD. Hosted by Malik Forte of Nerdist Industries, Survios will manage the viewing experience by providing much more than simply what the user sees. Complete with commentary and interviews lead by Malik, this event and stream will provide a sneak peek into the future of livestreaming an active VR experience to a global audience. This event is sponsored by AMD and also supported by partners VRLA, Alienware, and HTC. For more information on the event please visit survios.splashthat.com and be sure to tune into twitch.tv/survios on Saturday night starting at 8:15pm PT. Members of the press interested in setting up an appointment at VRLA or coming to the Raw Data event are encouraged to contact TriplePoint PR at survios@triplepointpr.com. Survios is a Los Angeles-based virtual reality company focused on creating Active VR experiences and technologies that combine freedom of motion with engaging environments and narratives to provide the most immersive gaming experience possible. The company consists of a production studio creating high quality VR games for all platforms, as well as an R&D unit constantly pushing the boundaries of VR technologies. Survios, which emerged from Project Holodeck, a research project at the University of Southern California focused on full-motion VR gaming, is venture-backed to continue to push the boundaries of virtual reality innovation. For more information, please visit Survios.com.